If you weren’t already aware that the 1984 action-comedy Ghostbusters was a cultural touchstone for a huge number of people, that was certainly made clear when it was announced that an all-female reboot would be coming out a few years back. The backlash that met the new version of Ghostbusters was so intense and furious that it required the original film’s stars to defend the new ones while everyone involved fended off vile attacks from all corners of the internet. It ended up being a depressing experience for many involved, all of whom seemed to just want to pay homage to the original. That the remake was considered a failure (though not by everyone) only emboldened the angry mob to believe they were correct and their perceived ownership of the Ghostbusters franchise was valuable and necessary (I shook my head while writing that last part because it’s so dumb). “When” is now as Jason Reitman, son of the original film’s director Ivan Reitman, will helm a new Ghostbusters movie set “in the original universe.” According to the announcement in Entertainment Weekly, that means that while the film will be set in the present day, “what happened in the ‘80s happened in the ‘80s.” The all-female reboot had sidestepped that approach by setting their version in a world where the original film had never happened. Reitman won’t say if any of the original stars will return, though, given the fact that all three of the living original Ghostbusters (though Harold Ramis died in 2014) appeared in the reboot, it’s a solid bet most, if not all, of them will show up for this one. 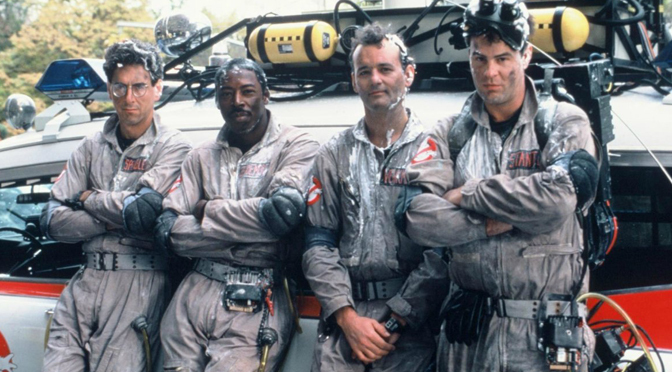 However, per Reitman, it sounds like the story will focus on a new set of Ghostbusters. Reitman co-wrote the screenplay for the new film with Monster House and Poltergeist remake filmmaker Gil Kenan. Whatever the film is about and whoever stars in it, it will be hard for some viewers to make sense of how they feel about it. There were so much vitriol and anger about the all-female reboot that the backlash created its own backlash. Defenders of the original film’s purity (or whatever) were so angry that it created an opposition who pointed out the original was, in fact, not actually that good (and pretty problematic when you think about it). There were many a thinkpiece and YouTube essay about the nostalgia, the value of pop culture, male entitlement, feminism, and whatever else anyone could attach meaning to in a film about four people who catch ghosts for a living in New York City. When the dust settled and the film was released, everyone had a strong opinion about the Ghostbusters franchise simply because you had to. You were on one side or the other and never the twain shall meet. But what if the new Ghostbusters remake ends up sounding pretty good? What if the cast is refreshing and full of bold choices? What if the storyline incorporates some of the issues that got baked into the success or failure of the remake? What if, to put things in Ghostbusters parlance, they cross the streams and make something that actually sounds good? It created an awkward dynamic because, regardless of what those details are, the misogynistic crowd who backed the campaign against the all-female version are going to claim victory for the duration of this film’s production and release. They’re going to stand up and say “this is being made because of us” and talk about how it’s the “correct” way to do reboots. They’re going to smug and obnoxious and boastful. All of which brings us back to the initial sentiment so many people thought to themselves in the midst of that backlash. “It’s just a movie, guys.” And that’s still true. This is just a movie. It’s going to be a silly movie, at that, about grown-ups chasing ghosts and getting slimed. But with everything that’s happened up until this point, it’s impossible for it not to be a movie with stakes, whatever that might mean to each individual. If the film succeeds or fails, it’s going to mean something. To a lot of people. More than it should, but that’s the point. So we wish the filmmakers success. Unless we don’t. Except if they make good casting choices. But even then? Or perhaps not? What do we consider a win? Or is it already lost cause? Or can both sides win here? And why are there even sides? It’s all so confusing. Way more confusing than the emotions surrounding a Ghostbusters movie have any right to be.